Socialist Francois Hollande swept to victory in France's presidential election on Sunday in a swing to the left at the heart of Europe that could start a pushback against German-led austerity. Hollande was set to beat conservative incumbent Nicolas Sarkozy by a decisive 51.9 percent to 48.1 percent margin, the TNS-Sofres polling agency said in a projection based on a partial vote count. Sarkozy, the current president conceded defeat within 20 minutes of the last polls closing at 8pm (1800 GMT), telling supporters he had telephoned Hollande to wish him good luck. Sarkozy, punished for his failure to rein in record 10 percent unemployment and for his brash personal style, is the 11th successive leader in the euro zone to be swept from power since the currency bloc's debt crisis began in 2009. Jubilant left-wingers celebrated outside Socialist Party headquarters and in Paris' Bastille square, where revelers danced in 1981 when Francois Mitterrand became France's only other Socialist president. Even before the results were declared, cheering crowds gathered at Socialist headquarters to acclaim the party's first presidential victory since Mitterrand's re-election in 1988. Many waved red flags and some carried roses, the party emblem. In Bastille square, flashpoint of the 1789 French Revolution and the left's traditional rallying point for protests and celebration, activists began partying two hours before the polls closed and a swelling crowd cheered as giant TV screens relayed the results. Hollande, a mild-mannered career politician, had held a steady lead for weeks after outlining a comprehensive programme in January based on raising taxes, especially on high earners, to finance spending and keep the public deficit capped. As much as his own programme, he is benefiting from an anti-Sarkozy mood due to the incumbent's abrasive personal style and to anger about the same economic gloom that has swept aside leaders from Dublin to Lisbon and Athens. 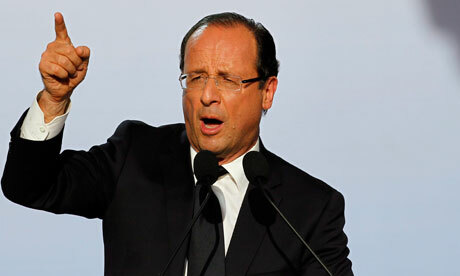 François Hollande wants to be seen by the public as the “Mr. Normal” of French politics: calm, measured and reassuringly honest. In short, he wants to be seen as Nicolas Sarkozy’s antithesis. In the first round of the presidential election, “Mr Normal” was in electoral terms “Mr Catch-all”. The socialist candidate fared well across all social classes; with men as well as women. Compared to all other candidates, this consistency is remarkable. “Mr Normal” François Hollande was on course to beat the incumbent president. François Hollande was the Parti Socialiste (PS) leader for 11 years and during that time he managed to preserve the unity of this most fractious party. He comes from the right-wing of the PS. In his younger days, he was close to Jacques Delors and other “social Christians”. Hollande studied at HEC – a well-known business school in Paris, then ENA, the Grande Ecole which trains the country’s political elite. He is not an old-fashioned intellectual in the Mitterrand mould, but a sharp technocrat. Like most politicians today, he is ideologically adaptable and ambiguous. Asked on France Culture who were his political mentors, he gave a long eclectic list of names: the Dreyfusard Bernard Lazare, Jaurès, Blum, de Gaulle, Jean Moulin, Henri IV, Marquis de Condorcet, Victor Hugo, Clemenceau and Salvador Allende. François Hollande is not interested in political ideas and reads few books. The election comes at a crucial time for the euro zone as France, Europe's No. 2 economy, is a vital partner for Berlin. Hollande will join a minority of left-wing governments in Europe and has vowed to renegotiate a budget discipline treaty signed by 25 EU leaders in March, to add growth measures. Berlin has made the pact a pre-condition of aid for struggling states. Hollande plans to visit the centre-right Merkel in Berlin within days of the election to discuss his ideas and planned to speak to her by telephone on Sunday evening, said Jean-Marc Ayrault, tipped as a likely Socialist prime minister. While financial markets are warming to Hollande's growth agenda, given growing support elsewhere in Europe, analysts say he would need to reassure investors quickly about his economic plans as fears resurface over the euro zone's debt woes. France is grappling with feeble growth and 10 percent unemployment, a gaping trade deficit and high state spending that is straining public finances and was a factor in Standard & Poor's removing its triple-A credit rating. Economists want Hollande to trim over-optimistic growth forecasts and impose spending cuts, but political analysts say this would be difficult with left-wing voters hoping he will raise the minimum wage and reverse a recent sales-tax rise.